Any trip to an island should include visits to the beautiful beaches that encircle it. 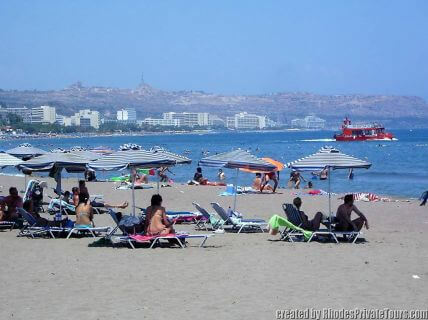 Let us show you the most popular beaches of the East Coast of Rhodes. 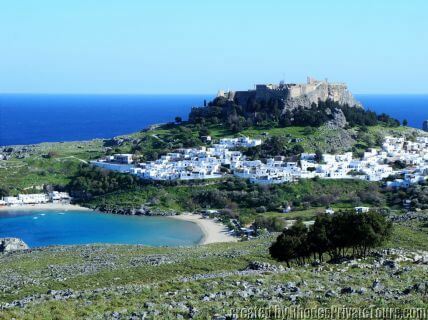 The highlight of the trip will be a visit to Lindos Village and Acropolis. You'll see spectacular views and crystal clear waters that will make you want to jump right in. In fact, on our return journey you do can just that. Choose the beach you like the most and we will stop there with plenty of time for you to swim before the end of the tour. 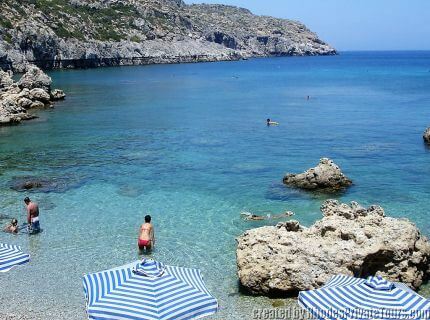 Private Tour Description: "Beach Tour of Rhodes"
Later your driver will meet you at the main square of Lindos (at a prearranged time) to drive you to one of the above beaches – of your own choice for sea bath. 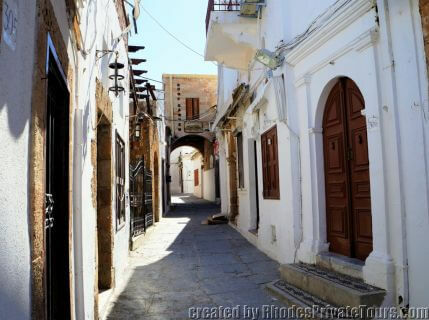 You can also choose an optional short stop at a pottery workshop where the traditional pottery of Rhodes is made. You can see the wonderful pieces of art, and watch the potter working at his wheel. You can even learn the mystery of the Pythagorean cup. Just let your tour/driver know that you wish to make this short stop. Private Tour Extensions: You can extend or change the itinerary of this private tour as you like. You can add lunch time at a seaside village at the Mediterranean Sea right on the water’s edge (scenic) with fresh seafood, Rhodian cuisine and excellent local wines. Or you can add the highlights and landmarks you want to visit. Q: How much are the entrance fees to the beaches? 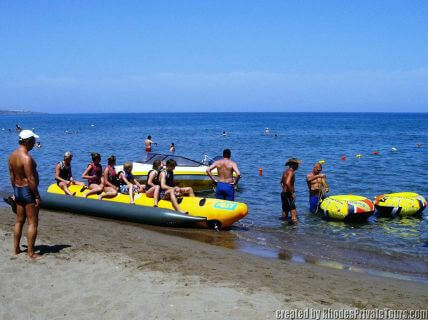 A: Entrance fees to all beaches is free, but you will have to pay only if you rent a sun bed 7 euros. 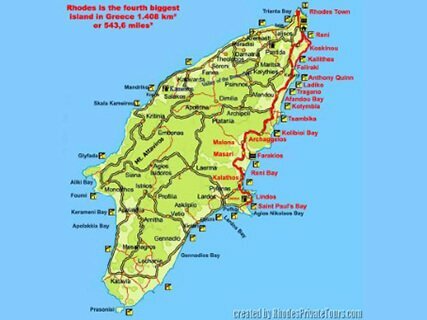 Q: Are all the beaches in Rhodes organized? A: Most of the beaches are very well organized with sun beds, parasols, changing rooms, restaurants or bars and turquoise blue water, while others offer only the basic amenities. 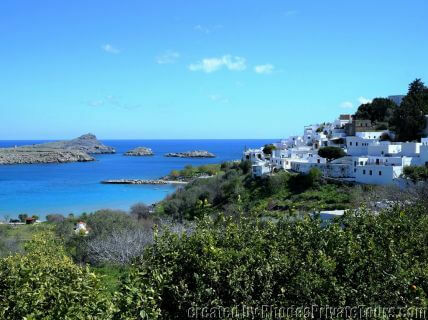 Q: How long will we stay in Lindos village? 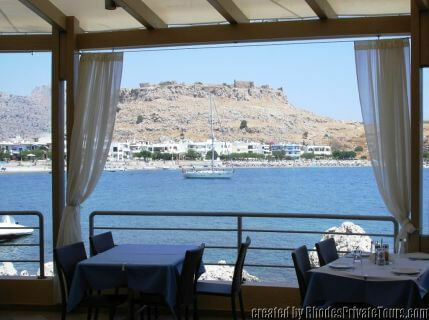 A: Usually we spend one hour in Lindos, but it depends on you for how long you need to visit Lindos. To climb up it takes 15 min, to take a look 30min. A: Entrance fee is 12 euros per person in the Acropolis (Children under 18 years old free). No charge to enter Lindos village. If you wish a donkey ride is 5 Euros per person. 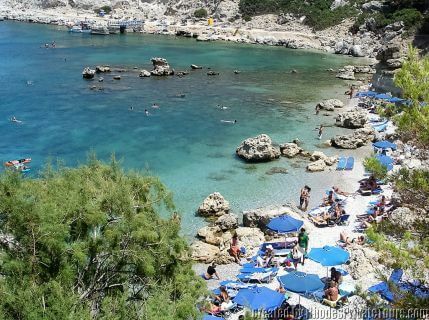 Q: Are there any other sandy beaches in Rhodes? 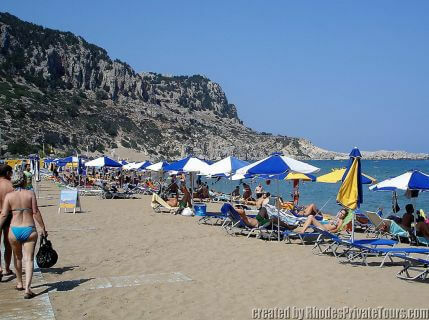 A: Yes, Rhodes hosts some of the most beautiful beaches in Greece, please visit Best Beaches in Rhodes.